The King of Rock ‘n’ Roll and the best-selling solo music artist of all time with more than one billion records sold worldwide, Elvis Aaron Presley created a revolutionary new sound that defined a generation and ignited throngs of fans with such hits as "Heartbreak Hotel," "Hound Dog," "Jailhouse Rock," and "Love Me Tender." He is regarded as one of the most significant cultural icons of the 20th century and now fans can get an inside look at a rarely seen side of Elvis – that of a music artist on a life-long search for self-expression whenELVIS PRESLEY: THE SEARCHER debuts on DVD and Limited Collector’s Edition October 16from Sony Pictures Home Entertainment. 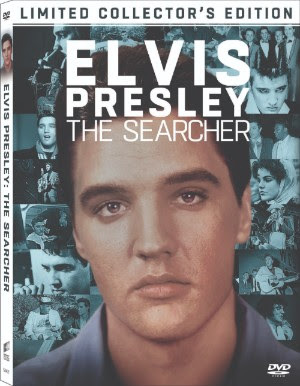 From the archives of Graceland and Executive Producer Priscilla Presley, ELVIS PRESLEY: THE SEARCHER is a three-hour documentary film presentation that focuses on Elvis Presley, the artistand musician, taking the audience on a comprehensive creative journey from his childhood through the final 1976 Jungle Room recording sessions. Containing never-before-seen footage and music recordings, the film features commentary and interviews from some of the biggest names in music including Tom Petty, Bruce Springsteen, Emmylou Harris, music producer Jon Landau and Elvis’ guitarist, Scotty Moore, among others.